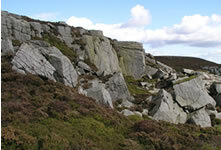 Thorn Crag, in the Forest of Bowland, is natural gritstone in a pleasant moorland setting with distant views of the sea and is easily accessible from Junction No.33 on the M6. There are links to photos and videos of routes at Thorn Crag on the Lakes Bloc website. See the Rock and Run website for printable PDF guides to the Thorn Crag Bouldering and also for Thorn Crag Rock-Climbing.